Save AED 36 (55.38%) – Earn 3 Shukrans What is Shukran? Shukran is the Landmark Group’s award-winning loyalty programme in the Middle East, which allows you to earn Shukrans when you shop any of our brands. 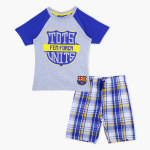 Dress up your little angel in this adorable t-shirt and shorts pyjama set and pep up his appeal with grace. With the FCB branding and chequered shorts, this set is assured to be a favourite.